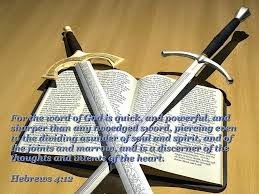 The Word of God is sharper than any two edged sword. The Word of God is living and active. The Word of God is quick and powerful. This verse has been on my mind a lot this last week. I've been repeating it to myself, and thinking about it's meaning. The two edged sword is especially fascinating to me. My Bible, the one I carry around in my back pack and have beside my bed. The one that's got packaging tape on the pages to keep them from falling out. The one that's all marked up. This Bible, is alive and sharper then any two edged sword. As I was driving yesterday and thinking about this sword; it occurred to me that this Sword has the capacity to cut out, really cut out, what I do not want. This Word lives inside of me, because the Word is God. So, as I pray and ask for the power of this Word in my life, I can also ask to be cut by the two edged sword. With this powerful strategy I may bleed, but I will also be more and more active and living. As the Sword cuts, the Word discerns and divides. My thoughts become more and more like the thoughts and mind of Jesus. I think its bazaar. Odd. Crazy. It's incredible to think that this Word is that powerful.